As an American of one-quarter Polish ancestry, I became interested in Poland while researching my genealogy. This in turn led to an enthusiasm for Polish food, literature, and film. I’d been looking for an overview of Polish history, but didn’t really want to tackle one that was too dense or academic. Luckily, I stumbled upon Anna Spysz and Marta Turek’s 2013 book The Essential Guide to Being Polish, which was being offered as a Kindle Daily Deal. This pleasant surprise turned out to be just what I was looking for, plus a lot more. The book provides a broad overview of a thousand years of Polish history and culture, with an emphasis on the state of the nation and its people today. As the subtitle indicates, the book is comprised of 50 chapters, each of which reads like a brief article or encyclopedia entry. These are divided into five parts: Poles in Context (history, language, religion), Poles in Poland (customs, family life, food, drink, holidays), Poles in the Limelight (famous Polish artists, scientists, athletes, etc. ), Poles Around the World (the global Polish diaspora), and Poles in a Nutshell (the conclusion, about the “Essence of Polishness”). These chapters resemble the informative sidebars one finds in a Lonely Planet guidebook, only much more in-depth in their coverage, and with the benefit of having been written by native Poles. Authors Spysz and Turek were both born in Poland. Their families moved to the United States when they were young, and then each returned to Poland for college and professional life. They are the perfect guides for the English-language reader hoping for some insight into Polish culture past and present. As Spysz and Turek point out, the development of present Polish identity has largely been shaped by the country’s having survived being constantly attacked and conquered throughout its history. Despite their nation being completely wiped off the map for a couple centuries, Poles tenaciously managed to maintain their national identity. Whether under the tripartite Prussian, Russian, and Austrian partitioning prior to World War I, the Nazi occupation of World War II, or the Communist oppression under the Soviet Union, Poles have stubbornly resisted attempts to quash their Polishness and have emerged triumphantly independent as a proud and hopeful people. The text does get repetitive at times, as the topics of the 50 chapters often overlap. At times it feels like the same few events in Polish history are being relentlessly drilled into you, and prominent figures like Lech Walesa and Marie Sklodowska Curie make frequent appearances. I was a bit disappointed with the chapters on literature and film because they really didn’t tell me a whole lot I didn’t already know. In general, I wish the chapters in the Poles in the Limelight section would have been expanded to include more than just a few key figures, but that criticism is mostly due to my specific personal interests in those areas, as opposed to, say, the economics or politics of Poland, which other readers may prefer. The Essential Guide to Being Polish is an enjoyable read for anyone with an interest in that nation and its people. Those of Polish descent will find in it much fuel for pride. Though far from a typical tourist guide, it is loaded with valuable information for anyone planning to travel to Poland. I don’t know if I’ll ever make it there myself, but Spysz and Turek’s book definitely gave me a better understanding one of my ancestral homelands. Ethan Allen was more than just the Founding Father of Vermont, a Revolutionary guerrilla, and the namesake of a furniture store. He was also a philosopher. Like Benjamin Franklin, Thomas Jefferson, and other luminaries in the early history of the American republic, Allen was a deist, meaning he believed in God as the creator of the universe but denied that this deity took any interest in mankind’s affairs or prayers. Allen considered reason, what separates us from the animals, to be the greatest gift God gave us, and that to succumb to superstitions rather than exercising that faculty of reason would be a crime against nature. Such are the convictions behind the book that Allen published in 1785, Reason: The Only Oracle of Man. Deists are often defined as believers in the “divine watchmaker,” meaning that God created the universe and then just set it running as part of his grand plan, a plan in which humanity is but an infinitesimally insignificant player. All that happens in the universe is beholden to a complex chain of cause and effect tracing back to the moment of creation (though Allen insists there really is no beginning since God is eternal). Allen denies all supernatural occurrences because they defy this impregnable chain of cause and effect. Elsewhere in the book, however, he does express a belief in mankind’s free will, which he never satisfactorily reconciles with this deterministic view. At times Allen’s philosophy resembles that of Baruch Spinoza, particularly when he asserts that the universe knows no good or evil, but rather is indifferent to mankind’s conceptions of morality. In one of the most interesting passages of the book, Allen perhaps takes a page from 16th-century Italian heretic Giordano Bruno when he proposes that the universe contains myriad worlds, perhaps populated by a variety of life forms. Why then would God bother to cater specifically to our petty needs? One wishes Allen would have spent more time on these philosophical questions and quandaries, as a more fascinating book may have resulted from them. Unfortunately, about a quarter of the way into the book Allen commences a polemic against organized religion and he never really comes back from it. Rather than attacking the philosophical foundations of anthropomorphic theism he attacks its trappings. Among the religious beliefs Allen argues against are supernatural revelation, miracles, prophecies, and the trinity. He points out numerous inaccuracies and contradictions in the Bible, and holds a special grudge against Moses, the supposed author of the Bible’s first five books. Allen also questions the compilation, editing, and translation processes of the Bible’s creation, questioning how one could claim such a man-made text is the result of divine revelation. The points Allen argues are admirable but obvious. Back in his day, perhaps such an antireligious diatribe was necessary, but most of today’s readers don’t need to be told that the Bible shouldn’t be taken literally, and those that do aren’t going to be reading this book anyway. Reason: The Only Oracle of Man was not received favorably when it was published, and I doubt philosophical scholars of today would consider it a great work either. As a freethinker myself, however, I like the idea that one of my nation’s Founding Fathers not only believed such heretical thoughts but actually published them, and I admire him for putting his name on it, which must have been a gutsy move for his day and age. Though I can’t say I really enjoyed reading this book, I am glad it was written. The King in Yellow, a book of short stories by American author Robert W. Chambers, was first published in 1895. The collection is an oddly inconsistent mix, divided roughly in half between weird horror stories and more traditional romantic tales of American artists living in Europe. The book is largely remembered today for those stories in the former category. If Chambers had maintained the macabre atmosphere and style of the first five stories throughout the book, The King in Yellow would have been a much more cohesive and successful collection of fiction. The first four stories are all linked by references to “The King in Yellow,” which is a play, also printed in book form, set in the mystical realm of Carcosa. From its description, which includes a sky full of black stars, this Carcosa would appear to be some sort of parallel universe. We are given very little information about this mysterious land, other than the names of people or places within it, like the oft-mentioned Lake of Hali. It seems that anyone who reads this strange book suffers from insanity or visions of death. “The King in Yellow” may also refer to an actual being, likely a supernatural one, who seems to be ushering in a Carcosan takeover of our world. The first story, “The Repairer of Reputations,” is a mindblower. Set in the 1920s, it presents a dark, dystopian view of a future America. Chambers nonchalantly mentions the most bizarre imagery as if it were commonplace, like a man with artificial ears, a murderous cat, or a publicly funded system of suicide centers. Along with the bizarre title character, the narrator seems to be planning a coup to install the Yellow King, or a puppet ruler in his service, on an imperial throne. It eventually becomes apparent that the narrator is mad, as his tale blurs the line between reality and insanity. Years ahead of its time, this story reads like some weird movie by David Lynch. The next two entries, “The Mask” and “In the Court of the Dragon” follow along the same lines, but to lesser effect. However the fourth story, “The Yellow Sign,” is a masterpiece of creepiness in which an artist and his model are being stalked by a man who may be a corpse. The next entry, “The Demoiselle d’Ys,” is a more predictably gothic horror tale, like one of Poe or Conan Doyle’s lesser efforts. After “The Prophet’s Paradise,” an assortment of brief, forgettable prose poems, the last four stories are all tales of American artists living in France. “The Street of the Four Winds,” about one such artist’s relationship with a stray cat, is quite similar to “The Woman and the Cat” by French author Marcel Prévost, but I couldn’t tell you which came first. “The Street of the First Shell” is a meandering drama set in Paris during the siege of the Franco-Prussian War. Some of the blunt and gritty wartime scenes presage A Farewell to Arms, but it’s mostly a soap opera. “The Street of Our Lady of the Fields” is a terribly slow, pointless, and mean story about an American artist, newly arrived in Paris, who falls in love with a loose woman but is too naive to realize it. The following story, “Rue Barrée,” though somewhat more interesting, is essentially the same subject matter, though the woman in question’s only sin is her status as a working girl. Despite Chambers’s pretensions toward the bohemian lifestyle, these artist stories are really hopelessly preoccupied with classism and aristocratic condescension (on the part of the Americans, oddly). The last few stories are also plagued by dumb, inconclusive endings. If you like horror stories, the first four or five pieces in The King in Yellow are certainly worth a read, but there’s little to recommend in the book’s dull latter half. Canadian author James De Mille’s novel A Strange Manuscript Found in a Copper Cylinder was originally serialized in Harper’s Weekly before being published as a book in 1888. In this science fiction adventure, four yachtsmen on a pleasure cruise pluck the titular cylinder from the sea near the Canary Islands. As they take turns reading the pages it contains, the text reveals the fantastic first-person narrative of a lost sailor who drifts to Antarctica, where he discovers an undiscovered civilization at the South Pole. De Mille’s novel bears obvious similarities to other classic lost-world novels like Edgar Allen Poe’s The Narrative of Arthur Gordon Pym of Nantucket, Jules Verne’s Journey to the Center of the Earth, Edgar Rice Burroughs’s The Land That Time Forgot, and Sir Arthur Conan Doyle’s The Lost World. There’s a reason, however, why De Mille never became a household name like those other adventure writers. Though all of the aforementioned novels are rather overrated, A Strange Manuscript in a Copper Cylinder is worse than all of them. One thing I will credit De Mille for is he doesn’t waste much time. Verne will sometimes make you wait half a book before a monster appears, but De Mille hauls out savage tribes and ichthyosaurs in the first couple chapters. After a few chapters, the narrator, Adam Moore, follows an Antarctic river to the land of the Kosekin, a civilized race thriving in a warm pocket of climate at the bottom of the Earth. Unfortunately for the reader, he pretty much stays put for the rest of the book. A biblical explanation is given for the existence of the Kosekin, one that will be familiar to frequent readers of century-old adventure fiction. As a race, they are defined by the ways in which their culture is opposite to ours. While we love life, they love death. While we love light, they love darkness. While we appreciate wealth and power, they strive for poverty and squalor. This Bizarro World gimmick might be entertaining for a chapter or two, but it goes on and on for the rest of the book. By the tenth or twelfth chapter the reader has had more than enough. De Mille is like a comedian who tells the same joke over and over again. And what exactly is he satirizing with this culture of self-negation? Socialism? Buddhism? Christianity? The reader soon stops caring. The best part of the novel is the occasional commentary provided by the four yachtsmen, who argue over the veracity of Moore’s narrative. One character asserts that the manuscript is a hoax, and the objections he raises are the same ones that have been popping into the reader’s head all throughout the reading of the book. As the four gentlemen discuss the scientific, sociological, and linguistic details of the manuscript, one realizes how much thought De Mille put into his construction of the narrative. If that’s the case, however, why are the Kosekin so simplistic and boring? I was prepared to give this book a better rating (that is to say, a mediocre rating) until I got to the last two sentences, which are the worst ending to any adventure novel I’ve ever read. While it might make sense to abruptly cut short the “strange manuscript,” as Poe did with his Pym narrative, what could De Mille possibly have been thinking when he decided to tack on such a brief and inadequate epilogue to the four yachtsmens’ commentary? Unless he just happened to die at that point in writing of the book (which is a possibility, since this was published posthumously), there’s really no excuse for it. Unless you’ve read just about every other classic sci-fi novel featuring a lost utopian or dystopian civilization, and you just can’t get enough, this Strange Manuscript is best left in its cylinder, with the lid screwed on tight. Polish author Henryk Sienkiewicz, winner of the 1905 Nobel Prize in Literature, is best known for his romantic historical novels, like his grandiose trilogy on the Polish military (With Fire and Sword, The Deluge, and Pan Michael) or his epic of ancient Rome, Quo Vadis. Sienkiewicz’s novel Without Dogma, published in 1891, is a deliberate departure from the trilogy that made him famous. Not only is it free of action and violence, it can also be characterized as a romance novel, or at least a novel of manners. Without Dogma also differs from typical Sienkiewicz fare in that it is set in the modern world and written in a style that, while it probably couldn’t be called realism, is nevertheless more realistic than any other work of his that I’ve read. The story takes place in the 1880s and is written in the form of a diary. The narrator, Leon Ploszowski, is a young Pole of a wealthy family. Rich enough not to require a career, he has found no calling in life. Despite his education, intelligence, and refinement, he is a “genius without portfolio.” When the novel opens, he and his father are living in Rome, but they own an estate a few miles outside of Warsaw, called Ploszow, which is managed by Leon’s aunt. On a visit back to this ancestral home, Leon reconnects with a cousin he has not seen since childhood. The two fall in love, and their marriage becomes a foregone conclusion to their family, their friends, and even themselves. The relationship falls apart, however, when, through his own indecisiveness, his grief over the death of his father, and his meeting of another woman in Rome, Leon fails to commit to matrimony with Aniela. He soon learns to regret this mistake and spends the rest of the book trying to win back the love of his life. The title of the book refers to the fact that Leon is an agnostic with no faith or steadfast moral principles to guide him through life. Anyone who is familiar with this author’s work knows that Sienkiewicz was a devout Catholic, so this is certainly no autobiographical novel. Here his protagonist is not a hero or a role model, but rather a cautionary embodiment of societal ills. Leon represents the tendency of indecision and paralyzing self-criticism that Sienkiewicz feels is plaguing modern man after having turned his back on traditional faith and values. Nevertheless, Sienkiewicz portrays Leon sympathetically, doesn’t resort to dogmatic proselytizing, and doesn’t lay the social criticism on too thick. Though I have more in common philosophically with Leon than with Sienkiewicz, I still found Without Dogma a very compelling and insightful read. I was mostly ambivalent towards the love story, but I really enjoyed Leon’s interior dialogue. Though the “modern world” has changed considerably since the 1880s, much of what Sienkiewicz has to say here about modern man feeling lost amid a rudderless life devoid of philosophy, crippled by self-consciousness, still rings true. Like any novel of the 19th century, the love story feels antiquated and overwrought at times. What were considered acceptable courtship tactics back then often come across as stalking today. Yet, even when the reader feels that Leon is getting kind of creepy, there’s a sense that Sienkiewicz knows he’s creepy too, and is deliberately depicting him as unhinged. It’s a surprisingly naturalistic psychological portrayal from this author who is recognized as a paragon of romanticism. I enjoy Sienkiewicz’s military epics, but I really liked this book as well. It is much better than another of his novels set in modern Poland, 1899’s In Vain. One caveat: Without Dogma is a very long book. I never found it boring, however, and if you pace yourself, it really grows on you. Though born in Indiana, Margaret Hill McCarter lived most of her life in Topeka, where she was an English teacher in addition to authoring several popular historical novels set in Kansas. Her book The Price of the Prairie, published in 1910, is primarily a romance novel, but it is set against the background of real historical events in the Sunflower State. The narrator, 60-year-old Philip Baronet, looks back on his youth and his relationship with his childhood sweetheart Marjie. The fictional town of Springvale, where the story takes place, is located on the Neosho River, which would put it somewhere in southeastern Kansas, but the characters make frequent trips to Topeka, and a few travel farther afield. Phil’s adolescence coincides with the Civil War, and the book touches upon the border struggles between free- and slave-state factions, but the story mostly revolves around Indian affairs. Set against this backdrop is a convoluted drama of thwarted love, much like an Anthony Trollope novel on the Great Plains. Persecuted by jealous, greedy, and gossipy townsfolk, Phil and Marjie are torn apart by an annoying misunderstanding. Will their love overcome all obstacles and reunite them in the end? While the historical context is interesting, unfortunately McCarter is no Willa Cather, and this is no prairie epic. For starters, McCarter’s prose has a real problem with clarity, to the point that it’s often difficult to tell exactly what’s going on or who’s doing what. This problem is exacerbated by the way she frequently jumps about chronologically without warning. For example, one of the main characters dies, but if you blink, you’ll miss it. Then you find out several pages later that he’s not dead; McCarter was referring to an event that took place years in the future. She is also terrible at simulating ethnic accents or speech impediments, to the point where some dialogue is unintelligible. Phil Baronet’s narrative voice also has its problems, as McCarter is just not very good at telling the story from a masculine perspective. Phil never comes across as a genuine human being, just an old fashioned woman’s ideal of what the perfect romantic hero should be. Even when Phil is talking about himself, he gushes as if he were his own girlfriend. The book is at its best when it’s a full-on western, during the few chapters in which McCarter depicts warfare between the U.S. Army and the Native Americans. Here she is surprisingly successful, bringing a grittiness and urgency to military history reminiscent of classics like The Red Badge of Courage. In such passages the text has all the excitement of a John Wayne cavalry movie, but it would have to be one of his earlier films, of the decidedly anti-Indian variety. Native Americans are relentlessly depicted as evil and savage throughout the book, with the exception of a few brief, positive comments on friendly tribes towards the end. General Custer is portrayed as a knight in shining armor, and no mention is ever made of settlers stealing Indian land. Instead, the Whites are overtly credited with saving America from its former inhabitants. McCarter may have been the most successful Kansas novelist of her day, but it’s probably safe to say she was a big fish in a small pond. Even today, the list of classic Kansas novels is small, and McCarter’s work may show up on such lists merely for lack of competition. Though I can’t speak of her other work, this book in particular is not very good. If you’re looking for a good Kansas classic, try The Boy Settlers by Noah Brooks (1918) or Dust by Emanuel and Marcet Haldeman-Julius (1921). Search the Sky, a science fiction novel by Frederik Pohl and Cyril M. Kornbluth, was originally published in 1954. The story takes place in a distant future when mankind has colonized planets in other star systems. Because of the distance between these worlds, the transportation of people and goods takes centuries, during which time the interstellar voyagers, confined to their ship, reproduce for several generations. When one of these “longliners” arrives on Halsey’s Planet, it brings with it news that several human colonies in the galaxy may be in a state of decline, decay, or even extinction. Ross, a trader born on Halsey’s Planet, is offered the opportunity to undertake a mission to investigate this disturbing phenomenon. It is revealed to him that faster-than-light (FTL) travel is possible in a few small ships, but it has been kept a secret for fear the technology would be used for interplanetary warfare. One of these FTL ships is provided to Ross so that he may journey to distant stars and investigate the nature of this mysterious threat to humanity. Pohl and Kornbluth take a humorous approach to the story, and Ross’s journey has the feeling of a Gulliver’s Travels in space. Each planet he lands on exhibits strange customs and an exaggeratedly goofy system of government. The first world he visits has a culture based on ageism, in which the elderly are hailed as demigods while the younger citizens are treated as ignorant juveniles well into their adulthood. The second world is a sexist planet, ruled by women. The third and fourth are even more absurd than the first two. These different worlds are only loosely connected by the overarching mystery story, which often gets lost in the shuffle. It seems the main purpose of the book was simply to allow Pohl and Kornbluth to indulge in these weird alternate worlds. When Ross arrives on each new planet, however, he is usually greeted with imprisonment, which severely limits what the reader actually gets to see of these worlds. Each journey ends up being more of an escape narrative than an investigation into the scientific mystery at hand. The main problem with this humorous novel is that it’s just not very funny. There’s a lot of goofy slapstick humor, but as far as the satire goes, it is often difficult to discern what exactly the authors are satirizing. If the ageist world is intended to be a commentary on our society, it’s not a very pointed one. Likewise with Ross’s trip to the sexist planet, which despite being entirely ruled by women makes no feminist statement whatsoever. Ross suffers some of the sexual harassment that 1950s women would have endured on a daily basis, but still the premise is just used as an excuse for male chauvinistic humor, like women can’t drive and so forth. The humor improves slightly towards the end as the story veers into a touch of Idiocracy. Meanwhile, however, an attempt is made to tie this patchwork mess of a story together with a unifying theory that is actually pretty interesting but only developed and presented in the most half-baked way. The great threat to humanity is defined ever so simplistically, and a simplistic solution is contrived to combat it. The science not only seems faulty but also feels like an afterthought in a book full of bad jokes. I usually enjoy science fiction of this era, when writers like Mack Reynolds, Clifford D. Simak, and H. Beam Piper effectively combined visionary scientific theory with political and social satire that was actually funny. I had heard good things about this novel, and thought I’d give Pohl a try, but Search the Sky proved to be a big disappointment. 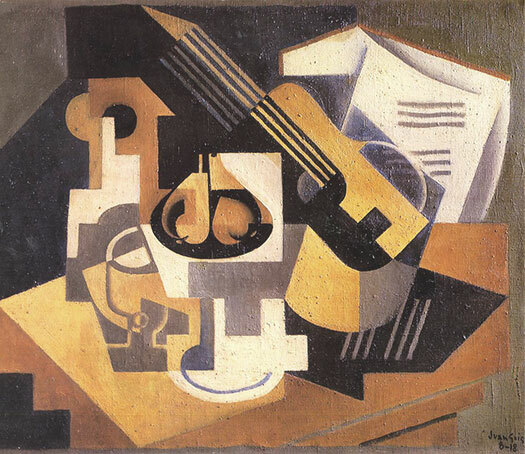 Though Pablo Picasso and Georges Braque may have founded the Cubist school of painting, and Albert Gleizes and Jean Metzinger wrote the manifesto for the movement, it was Juan Gris who truly mastered the Cubist aesthetic and pushed it as far as it could go, creating beautifully intricate paintings in which logic and lyricism compete to compose symphonies of spatial manipulation. 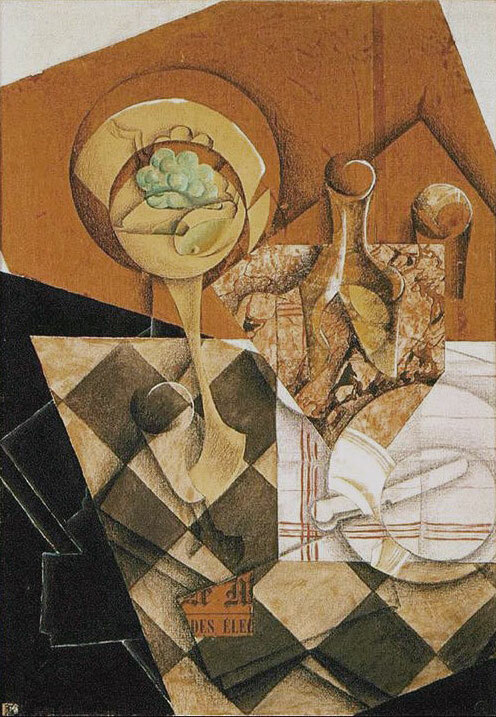 A fitting monument to this master’s genius, the book simply entitled Juan Gris was published in 1992 by Yale University Press to accompany a retrospective exhibition of the artist’s work at the Whitechapel Art Gallery in London. This substantial 9” x 11” tome contains 118 plates of Gris paintings and drawings from all stages of his career. Almost all are reproduced at a full page in size, and all are in full color unless the original work was in black and white. Around another 75 smaller black and white images illustrate the book’s roughly 200 pages of essays. While this book succeeds as a beautiful coffee-table showcase of Gris’s work, it also contains a complete and thoroughly detailed scholarly monograph on the artist and his art. The text by Christopher Green, who curated the exhibition, is written by an art historian for art historians, with little attempt made to make it accessible to a lay audience. (I have an art degree, and I found it tough going.) This is not a biography but a critical study, and Green expects his readers to come readily armed with extensive prior knowledge of Gris’s life and career. (He does include a four-page biography of Gris as an appendix. I would suggest you read that first.) Some topics Green covers include the chicken-and-egg balance between visual analysis of form and intellectual synthesis in Gris’s painting process, the role of Platonic philosophy in his art, and the personal meanings behind particular objects or figures he chose to depict in his paintings. Green analyzes numerous writings by contemporary critics and friends of Gris, often reconciling conflicting statements in order to elucidate insight into Gris’s life and art. The prose can be tedious and repetitive at times, as it is written in the case-building style of academic argument. Though the text delves into more theoretical hair-splitting than this general reader was looking for, I did learn a lot about Gris’s artistic process and pictorial techniques. In addition to Green’s contributions, the book contains two additional essays. 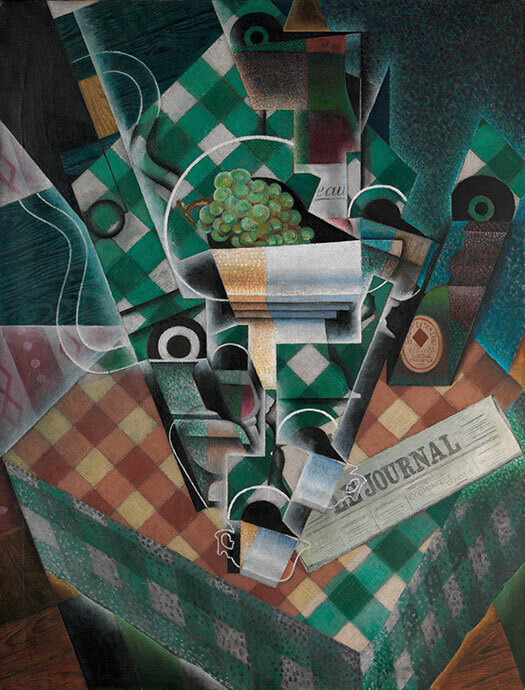 Karin von Maur writes about “Music and Theatre in the Art of Juan Gris,” including his set and costume designs for various ballet productions. Christian Derouet provides an essay discussing a recently discovered correspondence between Gris and one of his art dealers, Léonce Rosenberg. Both contributions help broaden the reader’s understanding of Gris, in particular von Maur’s essay, as it brings to light Gris’s work in a medium for which he is little known. Even though it was published a quarter century ago, when taking into consideration both the value of its authoritative text and the exceptional reproduction quality of its images, Green’s book is still likely the best book available on Gris. Its prohibitive price may put it beyond the reach of many readers’ private collections, but any respectable university library with a decent art department should have a well-loved copy on their shelves. Any artist or art lover with an appreciation for Cubism should seek it out. Eugene O’Neill, winner of the 1936 Nobel Prize in Literature and highly regarded as one of America’s greatest playwrights, has a good 10 or 12 masterpieces in his body of work. Amidst all the greatness, however, lie quite a few shorter and lesser-known works of variable quality. Fans of O’Neill’s work might derive some pleasure in investigating some of these obscure dramas. You never know what you’re going to get, and the element of surprise adds to the enjoyment. His 1924 play entitled Welded, however, is one case where that strategy definitely does not pay off. This dismal three-acter might just be the lauded playwright’s worst effort. Welded is the portrait of a marriage between a playwright, Michael Cape, and his actress wife, Eleonore. Given the subject matter, there’s likely an autobiographical component to this story, but one shudders to think what O’Neill’s wife must have done to him to produce this disaster. In the first act, the couple have a vicious argument. Michael has a very romantic conception of what the ideal marriage should be like, and he has little tolerance for any instance when his own wedlock should fall short of this perfect love. Needless to say, Eleonore finds it hard to live up to such unreasonable standards of blissful devotion. Michael is so insecure about their relationship’s imperfections that he is insanely jealous, and the fact that his wife had relations with other men before he met her is something he just can’t deal with. Furthermore, Eleonore’s acting career is built upon the plays that Michael wrote for her, so he has that to lord over her. By the end of the first act, the two are flinging insulting invective back and forth, and the end of their union seems imminent. In act two, man and wife each immediately go out and carry on exactly the way one would expect clichéd representatives of their genders to behave. Though likely intended to be a deep study of marital dynamics, Welded reads more like the transcript of a role-playing session in couples therapy gone wrong. An inordinate amount of text is taken up with stage directions, all body language and pregnant pauses, to the point where after a while the two leads aren’t even allowed to complete a sentence. They frequently just shout each others names—“Michael!”, “Nelly!”—or their annoying nicknames for each other—“My lover!”, “My Own!” Though O’Neill is known for his realistic depictions of dysfunctional families, this marriage is overwrought with the high-falutin’ histrionics of a pair of pretentious Romantic poets. The most realistic character in the play is a prostitute who unintentionally and thanklessly acts as the voice of reason. Welded probably would have added up to about an hour on stage. It would take two extremely attractive actors to make that hour tolerable, and to read it off the page is a very tiresome ordeal best avoided. Think of it this way: I read it so you don’t have to.